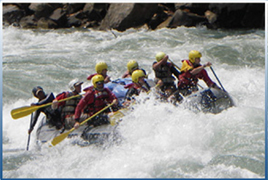 For people wishing to have fun with rafting, Nepal is the perfect place. Because of it's fast flowing, beautiful and powerful rivers rafting will be the perfect fun to make your heart feel happy and enjoyable. The rivers of Nepal are very perfect one for rafting because of having their sources in the glaciers draining the slopes of one or other of the great peaks, these mighty and powerful rivers cut through the Nepali countryside, swift and turbulent sometimes, placid and calm at others, providing an exhilarating means of viewing and ever-changing scenery.